In 1873, wealthy railroad magnate, Jacob A. Henry built his imposing mansion on Eastern Avenue, which was then referred to as "Silk Stocking Row." He employed a master craftsman from Germany along with three cabinet- makers to fashion the elaborate carved interior. It took three years to complete and has 16,800 square feet consisting of over 40 rooms. The main floor is most elaborate in carving and the black walnut and oak is hand rubbed to attain the satin finish. Each room contains an ornately carved fireplace. The deeply recessed windows are guarded with shutters on the inside. These fold back into casings for the sunlight to enter and also serve as storm windows in the winter. Sliding or pocket doors, carved and inlaid separate the rooms from the main floor. Its main feature is a magnificent staircase made of solid walnut with a half-landing surrounded by 119 hand carved octagonal spindles of burled walnut. 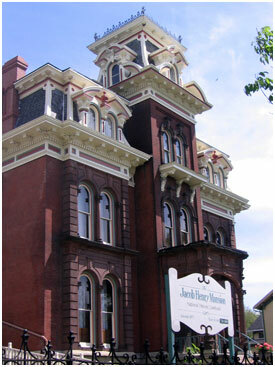 The Jacob Henry Mansion won the Architecture Award at the American Centennial Celebration in Philadelphia in 1876, and is claimed to be the largest and best example of Renaissance Revival architecture still standing in the state of Illinois. Today the lovely and fully decorated mansion, a National Historic Landmark, is well known for its beauty, Old Victorian charm and furnishings, as well as its delicious meals and entertainment, making the Jacob Henry Mansion Estate the perfect place for your next special occasion.